Note to my Readers: Sorry for the rant, but sometimes, I just have to get it off my chest. Sometimes when I look down and realize that we currently have 5 cats, I worry that I am someday going to be called the crazy rescue lady. I wish I could say that everyone gets along, but lately, with Muffin really getting on in years, and Kitty, losing her mind and peeing everywhere, the multi-cat (multi-animal) household, is not working as calmly as it used to. Over the last 30 year I have always had multiple cats: it went from Rosie & Eddy, add Babydoll & Wussy, subtract Eddy (breast cancer), subtract Wussy (kidney), add Alice & Gertrude, subtract Babydoll (cancer), subtract Rosie (old age), add The Muffin Man, Zackary, & Cuddles, subtract Alice (kidney), subtract Gertrude (old age), subtract Zackary (kidney), add Nine & Stella, subtract Cuddles (brain tumor), and here we are. And then the dogs went from Nikki, add Squash, lose Nikki, add Louise, lose Squash, add Sofie. 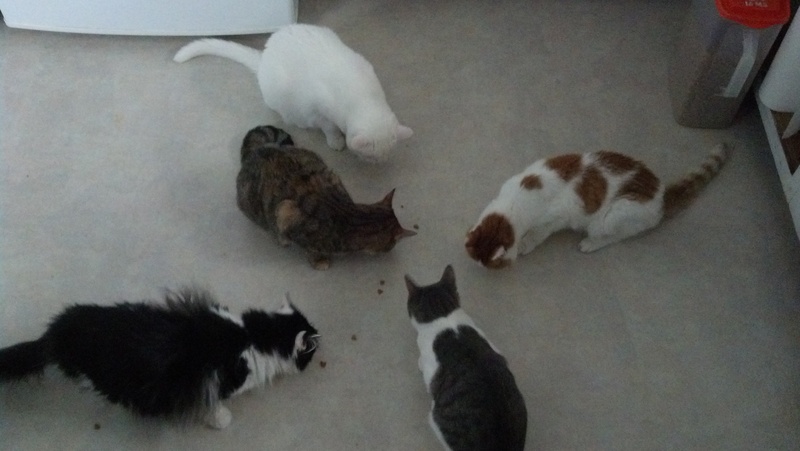 With 7 animals, someone is always crying that they are hungry and because Muffin wants to eat all the time (he is down to about 3 or 4 lbs), we feed the cats pretty often. The cost to keep the zoo in dog and cat food is killing me! We just switched the cats to 1/2 commercial brand (9 Lives at $.43 per can) because the good stuff (Wellness $1.65 per can) is so expensive. I am switching the dogs to something different too, but it is harder for them (they are more tummy sensitive). Currently I am moving them from Prescription Hills ID to VeRUS, Lamb and Brown Rice (not cheaper but maybe I will use less in the long run). You almost need a Ph.D. in animal science to figure out the best animal foods at this point, and when you do, you can’t afford them. Oh my! I will need to take a loan out of the bank to keep up with the 7 animal’s appetites at this point. Whose idea was all these animals anyway? Good thing that I don’t eat much (but how come they always want whatever I am eating too?). Oh, don’t get me started on the cost of dog treats these days……. You are such a good person! Yikes! If it will work at all for you, the only treat our dog gets is a carrot. She loves them, they are cheap, and they don’t hurt her sensitive tummy. Both my dogs will take the carrots and hide them under the couch but not eat them. Sofie is actually not a big treat eater, but they both really like bully sticks and rawhide. I’m only blessed with my ONE little chow hound, but I know what you mean. I think maybe the pets have started adopting new pets of their own!! Good policy, but they’re sneaking them in there somehow!! Would love to see it. I can try. Sofie is very fussy. I will post it soon and I hope Miss Sofie will like them. I only have 1 cat but he eats more than me! No way big girl – but maybe kilo to kilo it seems like it.